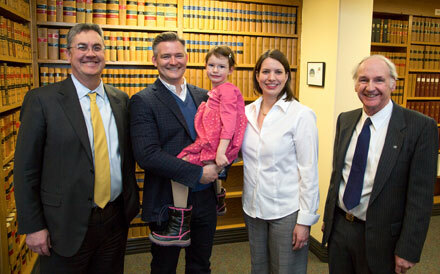 Giving something back to UNB through support for its students matters to respected law graduate Vaughn MacLellan (LLB ’95). He and his wife, Tiffany, recently committed $100,000 to enhance the MacLellan Family Scholarship, which they created to support and encourage accomplished law students who are assuming volunteer leadership positions within UNB's faculty of law, the University or the larger community. Vaughn knows something about leadership. As a lawyer practicing in the areas of securities and corporate law, he has volunteered on committees with the TSX Venture Exchange and the Ontario Securities Commission. He is also a dedicated community volunteer who gives generously of his time to organizations in Ontario and New Brunswick. He credits UNB with giving law students the skills and confidence they need to succeed. After graduating from UNB, Vaughn earned his master of laws degree at the London School of Economics. He has practiced with Stewart McKelvey, Wildeboer Dellelce and DLA Piper Canada. Since 2008, he has been commuting from Toronto to Fredericton to teach a course on corporate transactions at UNB’s faculty of law.